Twitter can be a great tool in your marketing efforts. But this is only the case if you use it effectively. You need to understand the best way to make a good impression and rapidly increase your followers. The first thing you should do when starting out on Twitter is to upload your photo and use your real name so people know who you are. Don’t forget to fill in your bio and add a URL to your site. You also need a cool background to finish off your profile page. Now you can get busy tweeting, since the most important part of your profile will be all your great tweets. Extra Tip: use backup tools such as TweetBackup, Backupify or BackupMy Tweets. A good rule to follow is to not just tweet your sales pitch. This will only put off your followers and lead to people getting bored, annoyed and simply un-following. You need to share lots of different cool and interesting things. Share tips. Links, videos, photos, audio, resources, recommendations and re-tweets. Connecting your website to Twitter is really simple. Add a Twitter follow icon or link on your site to make it easy for people to join you on Twitter. Using tools like NetworkedBlogs or TwitterTools to automatically share new content on your site. Linking your Facebook fan page to your Twitter profile is always a good idea. Keep the reason you are on Twitter and your ultimate goal in mind. Is it to build up your list or credibility? Do you want to increase your site traffic? Or connect to people within your niche? Focus your efforts on Twitter to help achieve your aims. 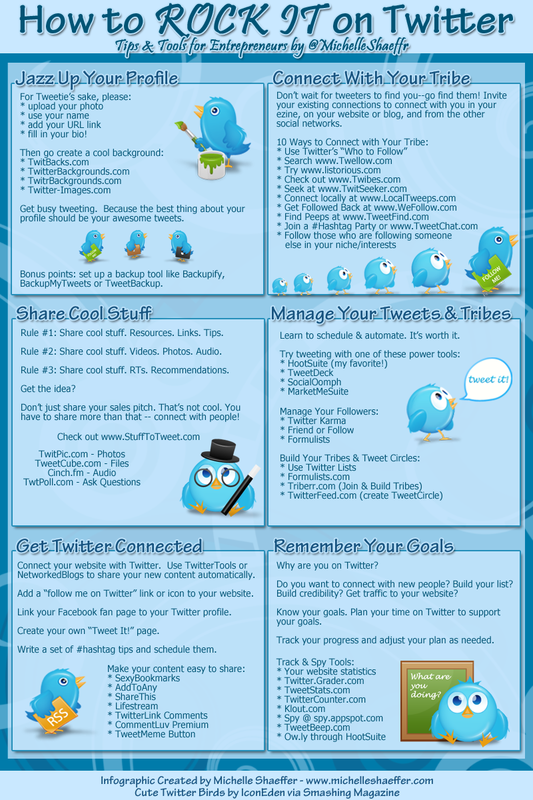 By following the above tips you can rock it on Twitter, and improve your marketing campaigns.